IronMakeover: Congratulations Ruth! World Champ! 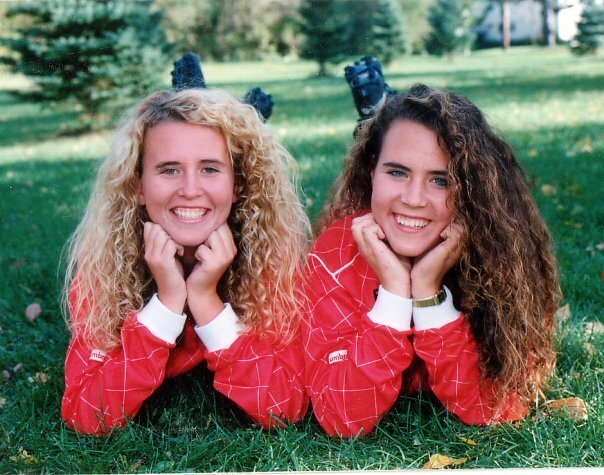 My sisters and I grew up playing soccer. My sister Susan played with a group of really talented and close-knit players, including a girl named Ruth Brennan who later played for the Badgers (UW-Madison.) I also competed for the Badgers but in rowing. During the years we were both on campus it was fun to catch some games with Ruth playing. Overall I have so many great soccer-filled memories! With three sisters playing soccer, we were either playing, practicing or watching each other play -- very fun! I loved getting to know the families too. My Dad can remember scores, game-changing plays and all sorts of fun details. I don't have ALL the details, but I do remember my Dad pointing out our friend Ruth specifically one day. We were in a gym, maybe it was a tryout session, I don't know. But Dad pointed at Ruth who instead of resting or chatting with friends was busy practicing her foot skills and he said, "there's an athlete." Now, many years later, Ruth's applied her gifts, time management and incredible drive to a new sport -- triathlon! It was so fun to open a USA Triathlon press release and find a quote from Ruth within it. Ruth (now Brennan Morrey) recently raced with Team USA at the 2011 ITU Long Distance World Championships in Henderson, Nev. Cold water and air temperatures led to the cancellation of the swim, and athletes competed on a 120-kilometer bike and 30-kilometer run course after a time trial start. Via facebook she describes the bike course as "hilly and windy but fun and beautiful. The run was 2.8 mile steep hill up then 2.8m down x 4." She finished in 6:00:49 taking first place amateur overall by eight minutes! "I felt phenomenal on the bike," says Brennan Morrey. "It was so much fun. It's a great sport, it keeps me healthy, and it's just a great experience." Read more about Ruth in this Rochester Post-Bulletin article. We all grew up in Rochester and I worked for the Post-Bulletin in high school. - What sport did you play growing up? - What sport would you still like to try? 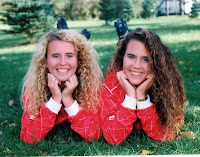 photo: Me with fake blonde hair & my sister Susan in our high school soccer uniforms. Wow, that's really neat! So cool to see old friends excelling in a common area. I played church league basketball in school, but that was it. I was honestly more into ladies and music than athletics.